When I decided that I wanted to make the weekly commitment to go to Plaza de Anaya for belly dance classes, I then had to decide who I was going to study with. I knew I wanted to learn tribal, but there were group tribal classes on THREE different nights! Which to choose? I ended up settling on Anaya Tribal over ATS or Domba, because Thursday was a good night for me and I saw that Cari and Tiffany used to dance with Nawari at the Ren Faire, and I LOVED that group! I'm happy to say that I made the right decision -- although there probably wasn't a wrong decision. Learning from Cari and Tiffany has been a treat! They have a very polished and exact style of tribal, with a lot of the basics that you'll learn in any class but also a lot of unique combos. The vocabulary is staggeringly large and varied, and ever changing, with new moves occasionally added and old moves dropped out when they fall out of favor. This ever-evolving style means that after over 2.5 years with them, I still don't have the entire curriculum committed to memory and there's always more to learn and room to improve. In addition to teaching beginner, intermediate, and advanced ITS, Cari and Tiffany occasionally offer classes in sword and skirt. 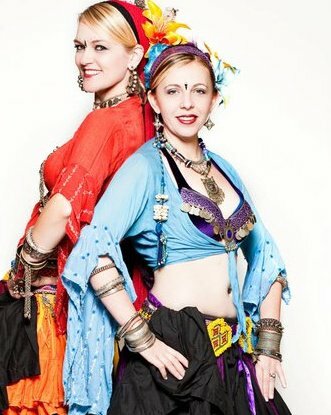 They travel to many belly dance festivals and SCA events to teach workshops and vend their costuming wares. Oh, did I not mention the costuming? I did now. They have the best pantaloons and the cutest vests, not to mention gorgeous bras at affordable prices. You can learn more about Anaya and do a little shopping at the Anaya Tribal website. Cari and Tiffany also direct The Anaya Tribe, a student troupe of various levels of dedicated students. I spent several happy, albeit frenetic, months as a member of Anaya Tribe performing at a variety of shows. The Tribe is a great way to improve your dance, get performance experience, and make friends. I'm sad to be leaving it at the end of this month! By the way, Anaya member Danna was also helping with the classes for a while but then she had to take some maternity leave. Her daughter Zoey was born yesterday! Congratulations, Danna!